In 2006 Trey Klain's grandfather gave him the best gift that any ranch kid could receive—his first cow. He remembers his grandpa saying "I think Trey needs a cow—I've got one picked out" and being so excited he wasn't sure his grandpa was even serious. At the time, Klain was only 5 or 6 years old but he recalls that day as "one of the coolest things that ever happened." Flash forward twelve years: Klain's herd has significantly increased from his grandpa's gift. He is an active member in the ranching community and Simmental Association. He enjoys serving on the junior leadership team and showing cattle. He also still has cows out of his herd starter—number 578. "It's really cool to think back and see that [my grandpa] is the one that got me started," he explained. Klain is the son of Durnell and Darcy Klain and grew up with his two older siblings on the family's ranch near Ruso, North Dakota. The family does some farming, raises Simmental cattle, and has had an annual registered bull sale for the last 30 years. They have also recently branched into Angus cattle "a little bit." "I've grown up in it and just love it," Klain said about living on the ranch. He graduated from Turtle Lake-Mercer High School this past spring and while in high school was involved in basketball, football, track, student council, honor society, and was the president of his FFA chapter. Along with being involved in scholastic extracurriculars, Klain is also very active in the North Dakota Junior Simmental Association. He said he "became a member as early as I could." At that time, his brother and sister were still involved in the association as well. His sister was the treasurer and as she grew out of the program, the title of treasurer got passed down to Klain who held the position for six years. This past year he handed the torch off to another member and now serves on the board of trustees. One of the main things Klain has been involved in through the association is the state sale. "I've shown heifers at the sale and bought out of the state sale. It's a great way to meet other guys and meet other breeders," he explained. He has also sold some bred heifers at the sale and said he really appreciates getting to visit with other ranchers and finding out how his genetics are helping their herds or what kind of calf his heifers raised for them. 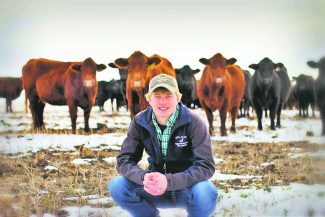 "The people in the cattle business is a big thing too, you talk about something and everyone else has the same problems and the same hopes," he explained. 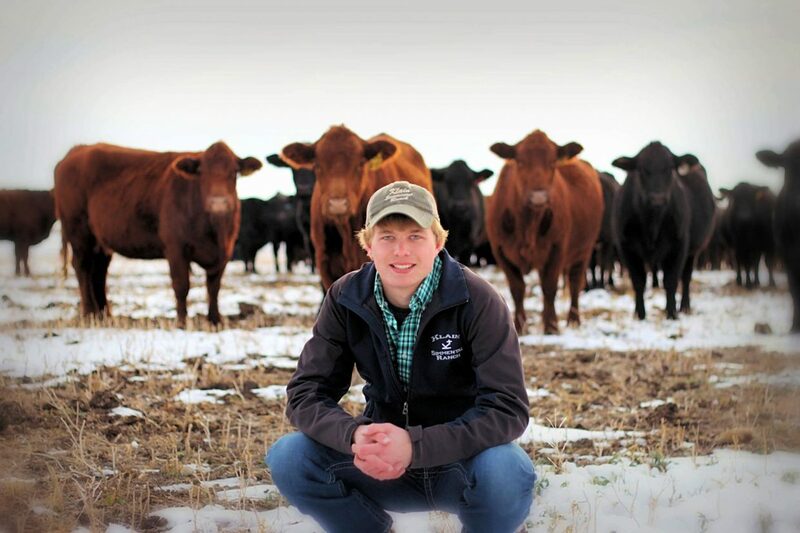 Klain's involvement with the association, leadership abilities, and drive to pursue a degree in agriculture helped him earn a $500 scholarship from the North Dakota Simmental Association. Klain said the he remembered watching his older friends in the association get announced to receive the scholarship and always planned on applying. Kim Myers, ND Simmental Association Secretary/Treasurer and Junior Advisor, explained that the board looks to see how active the scholarship applicants have been in the association, what other activities they have been involved in, and how they have demonstrated leadership qualities. One thing that Myers especially appreciated about Klain was his leadership skills. "He helps the younger kids [in the association] when they need help, and is just someone you can depend on," she explained. Klain expressed that "the scholarship is an awesome thing to get. I was glad to get it from an association that I'm very fond of and involved in and plan on being a part of for my whole life." According to Myers, Klain was "well deserving of this scholarship and the board was pleased to select him for the award." This fall Klain will be attending North Dakota State University to pursue a degree in animal science where hopes to further his background in cattle and learn more about genetics. Following college, he looks forward to returning to his family's ranch to work on growing his herd and expanding the family's business and improving the genetics of their herd. Klain said his plans for the ranch include "showing bulls some more and getting our name out there a little more to expand our buyer and customer base." "We have a lot of local guys that keep us going," he explained and added that someday he would like to add out of state customers to their bull business as well. With these goals in mind, Klain is ready to continue growing into a leader in the agricultural community. "I don't get the mentality of feeling forced to come back [to the ranch]," he said. "I want to come back."